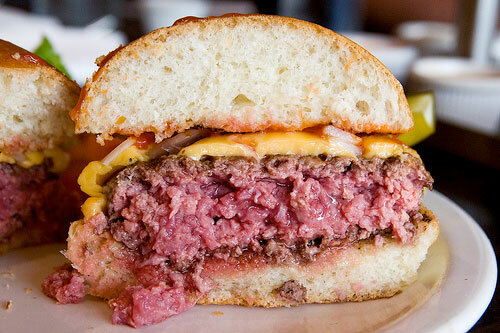 Rare burgers - a vanishing food? This post is an updated version of ‘ The FSA and so-called ‘risky’ foods’ which was published on 2 November 2014. Since then the Board of the FSA has met twice to consider ‘risky’ foods. Since it marked a starting point many may think it best to get off on the right foot. Steve Wearne, Director of Policy and author of the discussion paper, apologised at the outset for not being clear in the title of the paper about what he was talking about but denied any intention to demonise any food. We are then, it seems, supposed to overlook the fact that ‘risky’ foods are referred to throughout the whole report and were subsequently referred to as such throughout the Board’s discussion right up until the closing remarks of Tim Bennett, Chair of the FSA Board. A new category of food has taken on a currency and profile absent only a few days earlier. Does it matter? Yes, because it is indicative of an attitude and way of thinking which denigrates some great traditional food and could jeopardise the present and future livelihoods of some. So much for science, we are into perception and it’s only the second paragraph. Bias in FSA thinking is evident in many ways. If you go to a restaurant and order a rare beef burger, because that’s your preference and that’s what you are served, you may think it was perfectly cooked and send your compliments to the chef. The FSA, however, describe your burger as ‘undercooked’. A small matter perhaps, but it’s a value judgement which ought to have no place in scientific thinking and language rooted in objectivity. This is surely the point. All food carries risk, if it is acceptable for it to be placed on the market, it simply becomes a case of managing risk in the most effective way possible. It is not risky food we should be concerned about but risky practice in food production whenever and wherever it arises. The high levels of Campylobacter contamination in supermarket chicken dominating recent news headlines illustrate the point all too well. We already have what should be an effective system for managing risk in the foods we eat. It’s called HACCP or Hazard Analysis and Critical Control Points which all food producers are legally required to implement. HACCP is long established, tried and tested, and when rigorously followed and conscientiously applied it can be an effective way of managing risk. It looks like the FSA’s new approach will end up as a layer of domestic bureaucracy overlaying HACCP – one for which on this occasion we can’t blame the EU and which has a questionable legal basis. The FSA has, however, selected foods it perceives to be ‘risky’ to be in the frontline for this new approach with no real objective assessment. Chicken aside, cucumbers, leeks, salad and bean sprouts, to name a few, have all been the subject of food poisoning headline news in recent times. In September 2013, for example, 19 cases of E. coli O157 poisoning were associated with watercress and in 2011 an outbreak of E. coli in Europe affecting almost 3,000 people and which claimed the lives of 27 was linked to bean sprouts. It’s no surprise that research presented last year to the British Colombia Centre for Disease Control in Canada concluded that green leafy vegetables were one of the most frequent causes of foodborne illness. Public health bodies were urged to update their policies and informational materials to reflect the most high-quality evidence which characterised the risk of foodborne illness from raw milk as low. In the 10 years to 2012 there have been on average 891 instances a year of E. coli poisoning in the UK, none have been linked to raw drinking milk, nor has any other incident of food poisoning. On the other hand, the FSA estimate Campylobacter kills around 100 people and makes 280,000 sick every year. The evidence has long been there but only this year have the FSA commissioned research on the extent and significance of pathogens in salad plants. Will commercially bagged salad carry a health warning in the future? You can bet the bagged salad industry would be up in arms about any such proposal. Could it be that it is simply much easier to choose softer targets – small family dairy farms and independent restaurants – ones that would struggle to fight back? Small scale dairy farming is a tough enough business without regulators demonising what they produce. Davy’s Wine Bar and Restaurant had the capacity, having had the foresight to insure against such risks, to pursue a long legal battle with Westminster City Council and was able to put rare burgers back on its menu, others may not be so fortunate. The topic of rare burgers was back on the agenda for the last meeting of the Board of the FSA. Statistical modelling undertaken indicated an incidence of 19 cases of VTEC O157 infection for every 100,000 rare burgers consumed, but this figure takes no account of the controls which food businesses like Davy’s put in place to manage the risk. The incidence of infection would likely be similar to well-done burgers if this were to happen which is a level of risk the FSA clearly considers acceptable. The statutory remit of the FSA is to “protect public health from risks which may arise in connection with the consumption of food” so you might think it would focus its resources on those things which have the biggest impact. Perhaps the FSA should take on board the point highlighted by Dr Wildgoose and make supermarket chicken the first to be subject to this new ‘risky’ food framework? The rest of Europe, almost without exception, is proud of its raw food culture, one which in the UK we marginalise and, quite irrationally, describe as niche and ‘risky’ food with the clear implication it is to be avoided. We extoll none of the virtues or benefits of raw food. Meanwhile the FSA comes up with a way to legitimise its historical bias and, for all practical purposes whatever it says, creates a new category of ‘risky’ foods which can be vilified and demonised. Who knows which food will be next to attract this label? There will be one, then another and another, because where you draw the line is quite arbitrary.